Given what you have discovered so far in your experiment, what’s your next step in investing in your MVP and this idea? Because it’s easy to spend reach cash on advertising it’s important to have a thesis on why you’re investing in this idea. What I’ve outlined in the following section are tasks that you can continue to develop and learn about what your potential customers are searching for on the web and how you can stand in the path of their search to monetize your startup idea. Use this tool to test your content for Readability and SEO. It will score your post and give you tips of what you should improve. What did you learn?What are you going to do about it? Quality Score – my average quality score on starting keywords was a 2/10 or 3/10. After doing the items listed below, I was able to get them to a 5 or 7. Data Relevance – how does the ad map to the website for content? Performance Testing – I used the free 14 day trial of Pingdom to test speed. Click through rate – this will have to change over time – but as it improves, your costs for those keywords are likely to go down. Outcome: I need to work on Landing Page Experience more – improve the speed and on page experience. For speed, I’m working through these 19 things. For experience, I’m using A/B testing tools and looking for plugins. Restart the broader keyword search and try the campaign again. Remember, testing keyword spend is always good for Google. So unless you want to feel like you went to Las Vegas and walked away with nothing, you should plan on micromanaging the process for now. At this point, you could either buy traffic at reasonable economics or not. Time for another decision – do you keep pushing ahead with this idea? Have more cash to spend on Google? You can spend it there. 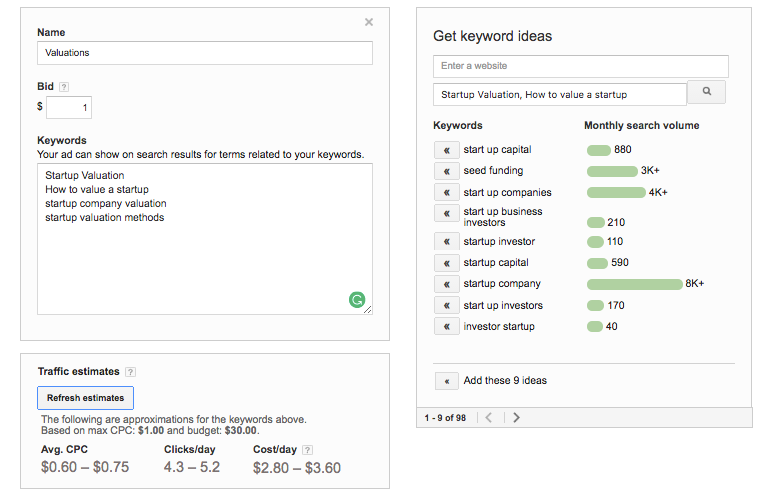 You can use the “Get keyword ideas” tool to understand the traffic and potential costs. Take some time to build out SEO traffic through building content. This is going to take time, so block out an hour, three mornings a week to write unique content. If you are unsure of the content as main website or Page content use Posts (blog posts) to test the content. AppSumo is installed. Start using these tools to test building your email list. More on this later, there are a lot of features here.